As beekeepers, we offer our bees a place to live. Whether they choose to stay is entirely their choice. If they decide they don’t like their digs, they swarm or abscond. But many bees live quite happily with the choice beekeepers provide to them, often for many years. However, a colony is an incredibly dynamic organism, constantly growing and changing its objectives. At some points of the year it will be focused on brood, then the honey flow will result in rapid growth in the honey store. As winter approaches brood production will be cut back as the colony goes all out into “efficiency mode”. Add to this the highly localized factors of weather, temperature and foraging resources and it’s impossible to define a single timetable everyone can use. The successful beekeeper is a watchful, curious and observant beekeeper. As this fascinating environment changes over weeks and months, beekeepers have an obligation to observe and understand these changes. With that awareness, we offer our bees the appropriate amount of space by adding (or removing) boxes. So what are the “rules” for when boxes should be added? As with most things in beekeeping, there are no hard-and-fast rules. But we can provide some general guidance. The brood nest is the areas of foundation assigned by the colony, across multiple frames, to the creation of new bees! This is where eggs are laid, subsequently to transform to larvae, then pupae and finally to emerge as adult bees. In a normal scenario, the boxes at the bottom of a Langstroth are dedicated to the brood nest and referred to as brood boxes (which is pretty logical!). For simplicity we refer to the addition of “boxes”, as the way to expand a Langstroth or Warre hive. 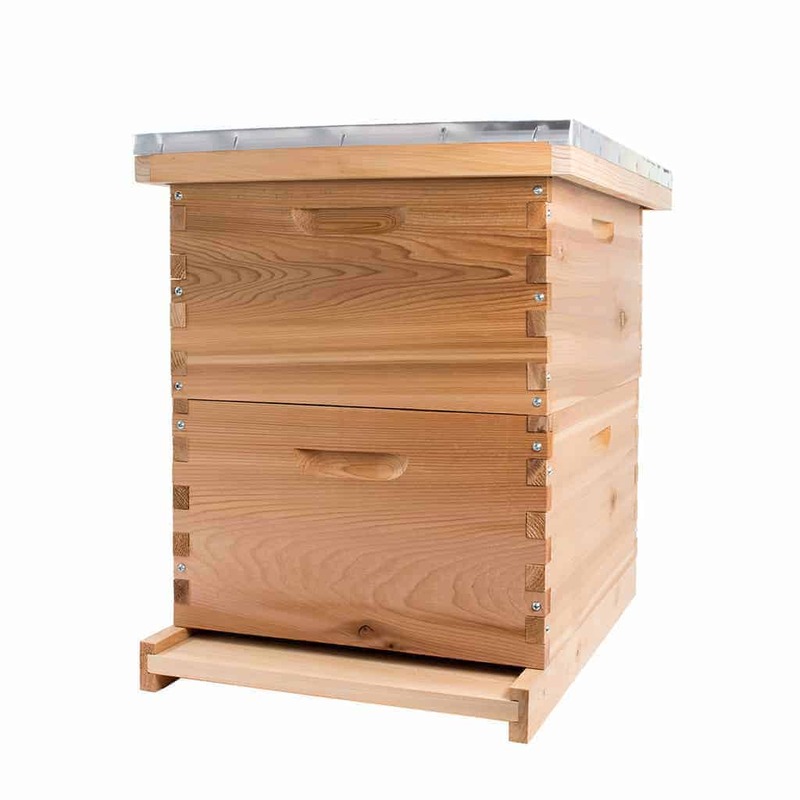 The Top Bar hive is a fixed size, with no option to expand. However, many beekeepers refer to those boxes intended to store honey as “supers” (or “honey supers”). As we will see below, there is also “supering” as a verb, namely to add another box for storage of honey. 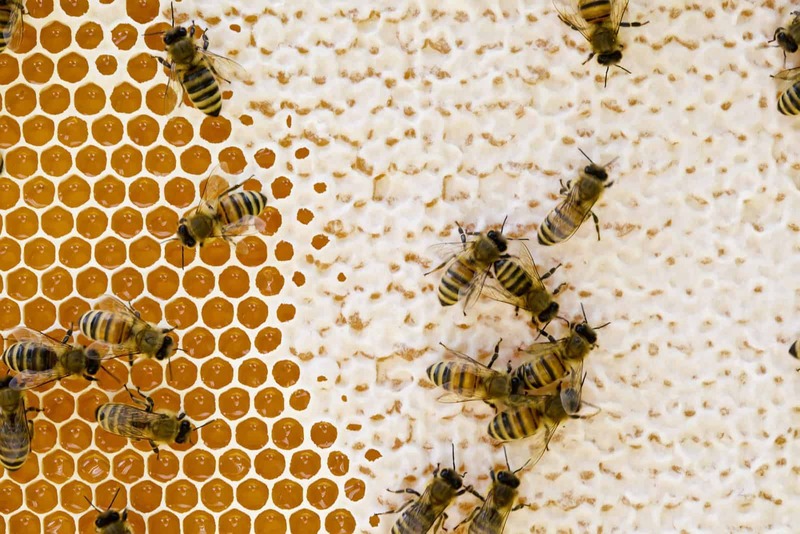 Regardless of whether or not you use frames with foundation, bees will create their own beautiful comb. Comb created by bees is called “drawn comb” and it is ready for brood, pollen or honey. The production and storage of honey is an elaborate and utterly fascinating process! It starts with the collection of nectar from flowers and involves “processing” within the hive and then storage within cells. When the water content of the honey has reached the appropriate level, the cell is capped, meaning it is covered in wax. The honey will remain in that state until the bees need it. The cap on honey is visually quite distinctive and is lighter than that used to cap brood. The image below shows capped honey on the right with – wait for it – uncapped honey on the left. The queen excluder is a simple metal or wooden grid, sitting above the brood boxes. Given the precise size of the holes, it allows worker bees through, but not the queen or drones. This is a way to ensure that no eggs are laid in the honey super. Opinions differ as to whether queen excluders are worthwhile. Given that even workers have to squeeze through a hole, those who oppose the use of queen excluders sometimes refer to them as “honey excluders”. Provocative! Given the PerfectBee recommendation to leave all honey to the bees in the first year, we do not feel the use of a queen excluder is justified in the first year of a colony. You have choices when it comes to box sizes (see our Langstroth Box Buyers Guide for details). Generally, you will deal with medium or deep boxes, although shallows are also available. You make this initial choice when you install your hive. For example, some beekeepers prefer to use a hive with three medium boxes while others prefer a couple of deeps. Either work just fine and this is simply down to preference. One factor in your choice will be the weight of fully-laden honey supers, which is obviously a little less with a medium, as compared to a deep. The other choice with the Langstroth is whether to use 8 or 10 frame boxes. Both have been common for a long time and work very well. Again, the benefit of the 8 frame box is that it is lighter, at the cost of storing less honey. 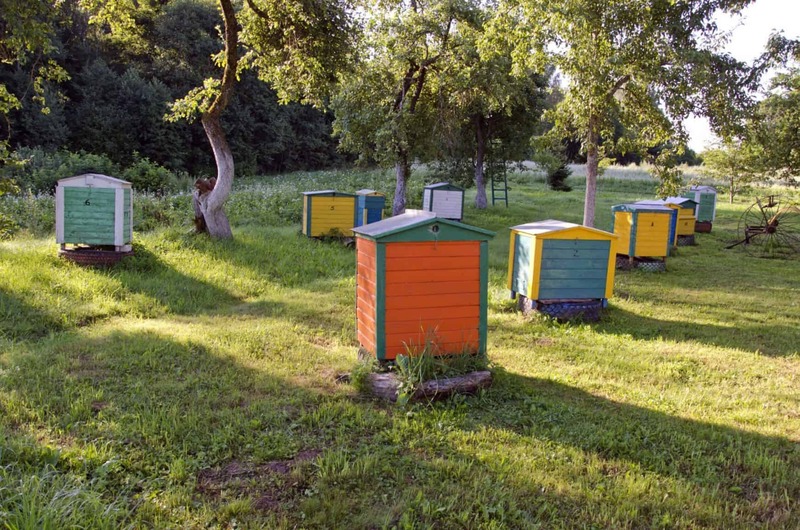 When you install a package of bees or a nuc you will start with a single box, either medium or deep. As the colony develops, you will add more boxes, on top of the initial box which will be used for brood. Let’s assume we start a beehive with a package of bees. Unlike starting with a nuc, the bees have to create comb. 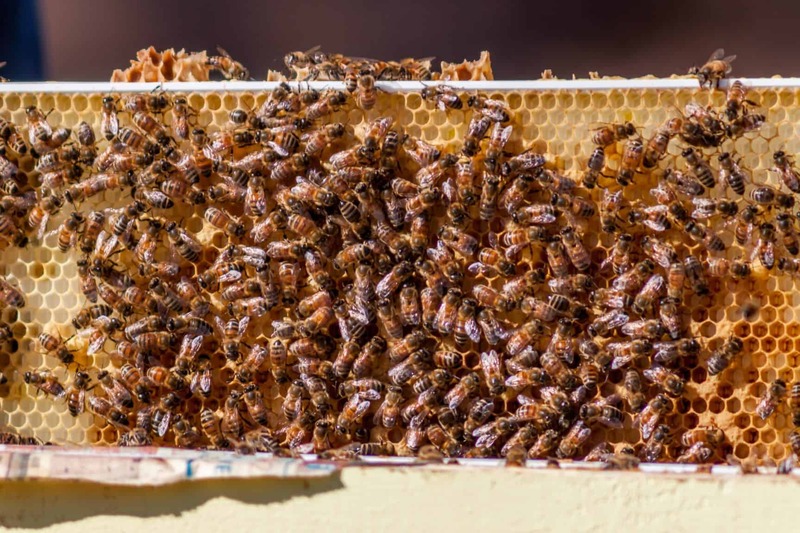 If you have frames with foundation, the bees will create comb on the wax-covered foundation. If you are going foundationless, bees will create comb, hanging down from the top of the frame. 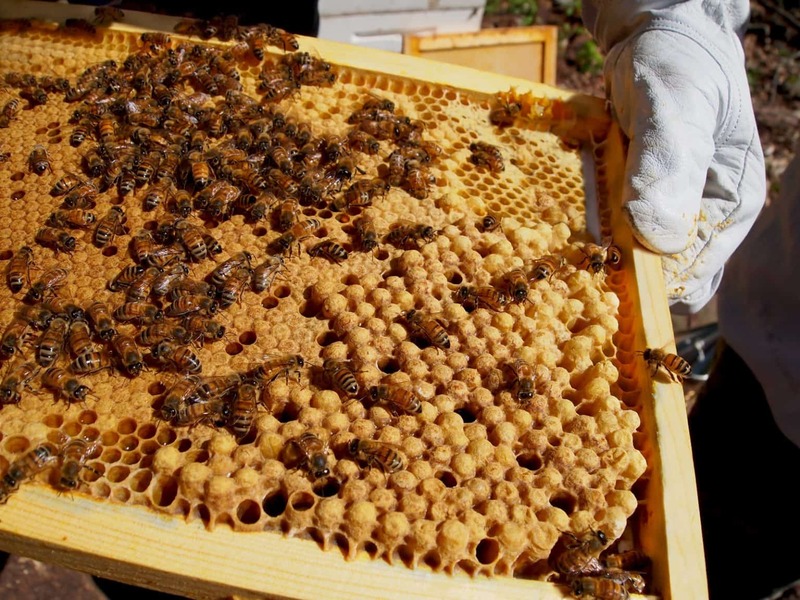 Regardless of whether you use foundation, though, the result in the bottom box is comb likely to be used for brood. This is where all the action will take place – the laying of eggs, the development of larvae which transform into pupae and then the emergence of adult bees. The myriad roles of the worker bee are enacted here, from attendants to the queen, nurse bees, housekeepers and more. It all happens in this lower box. As the brood nest develops, bees will eventually turn their attention to building reserves of honey. While the brood boxes will themselves contain a pattern of brood, pollen and honey, upper boxes will generally be used exclusively for honey. The reason to add boxes is rather straightforward, namely to ensure bees have the space they need for brood and honey. But there’s another important consideration, which is the threat of swarming. When bees feel they have too little space they will plan to swarm. If you leave it too late, they will be past the point of no return and you can’t prevent the swarming occurring. The key is to keep a close eye on how many frames your bees have used in each box. The bees will create drawn comb “out and up” in a Langstroth. This means they will start in the (only) box, using frames near the center of the box. The queen will then lay in the next frames away from the center and so on until the frames are all used. However, you should not wait until every frame has drawn comb. Instead, when 6-7 frames have drawn comb (in a 10 frame box), you should consider adding another box. The bees will continue to build out the comb in the lower box but will now have space to work upwards into the new box. As ever, there will be debate as to how many frames with drawn comb should be evident before a box is added. We’ve seen suggestions as low as 5 frames and as high as 8 (the latter seems too late, to us). Around 6-7 is a nice balance and what many beekeepers will use. Why not just add them from the start? A common question from new beekeepers is “Why not just start with all the boxes already installed?”. The reason to that too much space can also be a problem for bees. They need to stay warm and, depending on the location, even a summer evening can see temperatures drop significantly. Additionally, some pests and insects will find a safe haven in hives that are not reasonably well filled out by the colony. Adding another box to a colony that doesn’t need the space can indeed be a nice new home…but not necessarily for your bees! With an appropriately-sized hive, the bees can keep their living quarters warm and cozy! But with lots of empty space that creates a real – and unnecessary – challenge. So the best approach is to add boxes only when needed. You have a serious error here: The queen excluder is a simple metal or wooden grid, sitting above the brood boxes. Given the precise size of the holes, it allows worker and drone bees through, but not the queen. Thank you for your comment, Leo. We are a little confused as to where you located this error. Here is what we have in the article. “Given the precise size of the holes, it allows worker and drone bees through, but not the queen.” Was the mistake you discovered elsewhere? If you can refer me to that I will resolve, of course, but I am afraid I can’t locate the issue to which you refer. I think Leo’s comment questions whether the queen excluder allows both workers and drones to pass through or only workers. Aaaaaggggh – seems I need my coffee! Yes, I was misinterpreting the comment. My apologies. You are both correct, of course. I have update the text and thank you, Leo and Howard, for bringing this to our attention. Thanks again! So if a drone goes through the queen excluder.to the super.Then grows bigger than 4 mm ,the size of the gaps. In the queen excluders.it Will not be able to come back down to the brood box? So it should die above the queen excluders. As always – great information! Extremely helpful to a rookie like me! I had 1 hive swarm twice last year, not sure why. I have several overwintered double deep hives. So all the comb is already drawn and most frames are covered in bees. Some of it is filled with brood or food, but there are a decent number of combs that are empty. I have started feeding in order to get weight up as they are burning through stores. Also, I am in central texas. When deciding to add space in an an established colony like this, could you describe the general best practice? I could throw a super on them to be safe, but that would mean I need to stop feeding….and we are at least a month away from flow starting. Likely closer to 1.5 months. I have not yet purchased a hive, still educating myself and prepping because I want to do it right. The information here is very helpful and I appreciate the help. I do have a question concerning how to successfully manage the size of the colony. I’m not interested in becoming a commercial bee operation, just want to have a small colony to help the bee population and pollination of gardens and trees. How is this achieved? nannette, i have the same question. i’m worried that i’ll have too many bees for my one hive, and we don’t have room for another hive here. Is there a time to remove the lowest deep? Our hives are pretty full of honey and some eggs (2 deeps and added super this spring.It appears the queen may be running out of room and we don’t want her to swarm off. I can add another deep, but age and strength will make three deeps difficult for me to manage. Hi. I’m new to new keeping. I started my hive with a brood super and a medium super. 3 days ago. Can I still take out the medium super or will I desturb the bees?